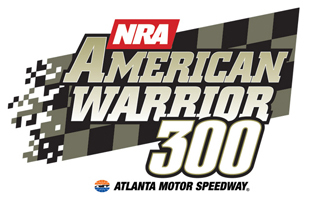 Kyle Busch won the pole at Atlanta Motor Speedway for the NRA American Warrior 300 with a lap of 31.45 seconds at 176.280 mph. This is Busch’s 24th pole in the Nationwide Series and first of the 2012 Nationwide Series season. Ricky Stenhouse Jr., Kevin Harvick, Kasey Kahne, and Denny Hamlin round out the top-5.